Researchers at the University of Kansas working with an international team at the Large Hadron Collider have produced quark-gluon plasma — a state of matter thought to have existed right at the birth of the universe — with fewer particles than previously thought possible. “Before the CMS experimental results, it had been thought the medium created in a proton on lead collisions would be too small to create a quark-gluon plasma,” said Quan Wang, a KU postdoctoral researcher working with the team at CERN, the European Organization for Nuclear Research. Wang performed key analysis for a paper about the experiment recently published in APS Physics. The unexpected discovery was said by senior scientists associated with the CMS detector to shed new light on high-energy physics. The KU researcher described quark-gluon plasma as a very hot and dense state of matter of unbound quarks and gluons — that is, not contained within individual nucleons. While high-energy particle physics often focuses on detection of subatomic particles, such as the recently discovered Higgs Boson, the new quark-gluon-plasma research instead examines behavior of a volume of such particles. Wang said such experiments might help scientists to better understand cosmic conditions in the instant following the Big Bang. 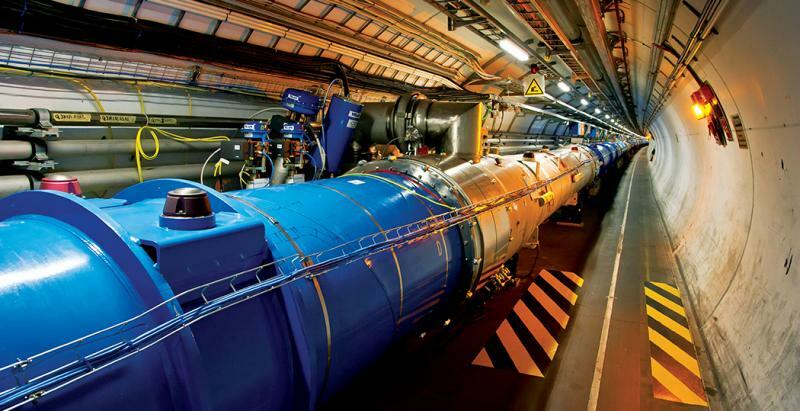 Wang continues his research at CERN’s Large Hadron Collider, performing analysis and working on the operations of a Zero Degree Calorimeter maintained by KU. The KU group at CERN, together with researchers from Rice and Vanderbilt universities, played a leading role in the analysis published by APS Physics. The group is supported by the U.S. Department of Energy.